A three-part series looking at the history of France’s black community and their long struggle for recognition. Between one and five million French citizens claim African or Caribbean heritage. These numbers are, however, estimates, as population censuses do not recognise race. For over a century, black immigrants, though never officially identified as different, were treated as ’others’. Even today, of France’s 577 members of parliament, only five are black. This three-part series tells the story of blacks in France - a long history of segregation, racism, protest, violence, culture and community building - from the turn of the 20th century until the present day. Over the weekend, the leader of Cuba's Las Damas de Blanco (The Ladies in White), Laura Pollan, fell ill. News of her hospitalization has come on the heels of successive weekends of the opposition group - along with other human rights activists - being targeted, allegedly on account of their anti-government protests. Bloggers, both on island and throughout the diaspora, reached out online to offer their support and wishes for Pollan's recovery. Pollan is one of the more fearless figures in the Cuban opposition, bravely leading the Damas on peaceful marches in Havana and other cities on behalf of their imprisoned loved ones and other political prisoners in Cuba. She has carried forth the group's campaign even after her husband, Hector Maseda, was released earlier this year after 8 years in prison. Last month, Pollan and other Damas were attacked by a Castroite mob sent to block them from marching in Havana to commemorate a religious feast day. News coverage included a photograph of Pollan and another marcher being pushed against a wall by a mob. Please keep this courageous woman and her family in your prayers. Fellow members of Las Damas de Blanco marched on Sunday along Quinta Avenida in Havana and prayed for the dissident leader…they said Pollán was in intensive care with respiratory problems caused by an as-yet-unknown virus. He said his overall impression after visiting Pollán was ‘very positive.' Maseda is a former political prisoner whose imprisonment inspired Pollán to help start Las Damas de Blanco, dedicated to freeing all political prisoners. In the face of limited information about Pollan's condition, words seemed inadequate; some bloggers simply posted photo tributes to the Las Damas leader. Cubans increasingly doubt what they are told, begin to read between the lines, and interpret, in reverse, information in the national media. The disbelief has gotten to the point where insult is deciphered as praise and vice versa. Those demonized by partisan publications are thus transformed into admired beings — albeit in a whisper — and even those fired from the government apparatus acquire a certain aura of appeal. Knowing this peculiar phenomenon of reinterpretation, the number of people who have called me to ask about the health of Laura Pollan does not surprise me. The great number of friends and onlookers who have gathered outside the Calixto Garcia Hospital emergency room where she was admitted for acute respiratory distress is comforting. Considering all the insults, curses, and lies that have been launched against this woman on the official television, the reactions of so many Cubans in solidarity with her is a revelation. The dozens of text messages transmitting medical reports about the leader of the Ladies in White, the prayers at shrines throughout Cuba, and the encouragement from so many other peaceful activists, are the major silencers of this shrill character who — in our living rooms — launches into a tirade we no longer believe in. Global Voices will post updates on Ms. Pollan's condition as they become available. 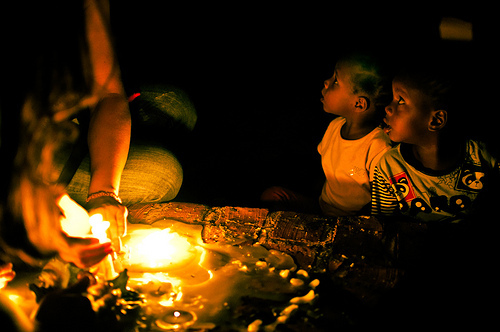 The thumbnail image used in this post, Las Damas de Blanco gritan consignas, is by Globovision, used under an Attribution-NonCommercial 2.0 Generic (CC BY-NC 2.0) Creative Commons license. Visit Globovision's flickr photostream. 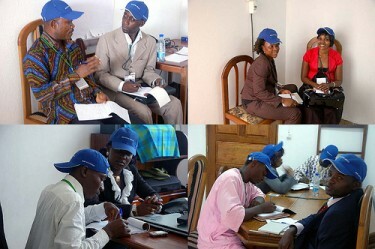 This post is part of our special coverage Cameroon Elections 2011. On October 9, 2011, Cameroonians will be called on for the sixth time in their country's history to choose a president for the Republic. 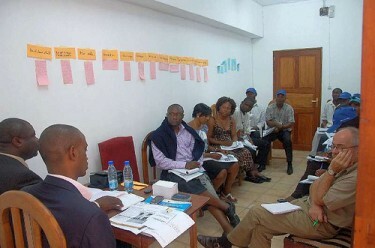 The election is characterized by the large number of both candidates and voters - more than 7 million [fr] of the latter in Cameroon and abroad - and by questions about the practices of ELECAM, the commission responsible for organizing the elections. The poll stations will be divided between 24,670 polling stations, that is 24,591 on the national territory and 79 open stations in Cameroon's diplomatic and consular missions which must accommodate the election. Malgré des efforts de toilettage dudit fichier par Elecam, certaines personnes ont des noms en doublons avec la même filiation sur différentes listes. Mais avec des numéros de carte nationale d’identité et des bureaux de vote différents. Cette supercherie est bien visible sur certaines listes électorales affichées. Despite ELECAM's efforts to tidy up the electoral roll, some people are still listed twice (duplicated names with the same parentage on different lists) but with different national identity card numbers and polling stations. This deception is clearly visible on some of the displayed electoral lists. ELECAM preparing for elections. Photo by DW Akademie-Africa (Creative Commons-2.0-NC License). Ce qui semblait être une simple formalité, tourne plutôt au cauchemar aussi bien pour les potentiels électeurs que pour le personnel administratif de Elecam […] Tous les bureaux d’Elecam ont été pris d’assaut dès l’annonce du début de l’opération de distribution des cartes d’électeur. Les listes affichées sur les murs de certaines délégations communales, à cause des intempéries, sont devenues illisibles, l’encre ayant été diluée par la pluie. A ce niveau, l’on vous demande de présenter le récépissé d’inscription à défaut d’inscrire vos noms et prénoms sur un bout de papier afin que l’on interroge l’ordinateur pour savoir si vous êtes inscrit et dans quel bureau de vote vous l’êtes afin d’entamer la recherche de votre carte. What looked like a mere formality, is increasingly turning into a nightmare, as much for the electors-to-be as for the ELECAM officials […] All ELECAM offices got stormed after the beginning of polling cards distribution was announced. The lists posted on the walls of some local authorities became illegible because of bad weather, with the ink becoming thinned down by the rain. At this level, you are requested to submit the receipt of registration instead of writing down your first and last names on a scrap of paper, in order to query the computer whether you are registered and in which polling station, before launching the search of your card. To cope with the crowds, one or two officers are seeing you, but only one is operating the search on the computer, and as hours go by, the queue gets longer and the argument heats up. Abuse, threatening and clamour follow between citizens and officials. Only the presence of a policeman in uniform, weapon slung over his shoulder, is able to prevent a clash. However, one big question remains: where to vote? Less than a week ahead of this election, excepted for the Cameroonians abroad [fr], many citizens still do not know which polling station they will have to go to in order to cast their vote, as no map of the polling stations has been made available so far. The other unknown factor is the possible impact of the numerous calls [fr] to boycott [fr] this election, which have been issued hither and thither [fr] all year round. News of Apple co-founder Steve Jobs' death yesterday made techies everywhere pause, reflect, and maybe treat their Macs, iPods, iPhones and iPads with more than the usual reverence. The death of this visionary leader, who helped transform not only the computing industry, but also the way in which consumers experienced digital media and communications, has left a gaping hole in the world of technology. Caribbean bloggers took the opportunity to say “thank you” and talk about the role that Jobs - and the company he helped revolutionize - played in their lives. Back then, the choices were limited to clunky PCs with Microsoft technology, Commodores, and Ataris. I chose the IIe because it felt right. It was user friendly and I didn't have to remember complex codes for commands, as if I was some postgraduate math major. All I had to do was point, click, and begin. It was that easy. Steve Jobs, it seemed, had created a computer just for me. Or that was how it felt. At the heart of Apple products is the desire to communicate and to make our sensory lives as rich and layered as possible. And the complex engineering is always expressed in elegant, user-friendly devices that follow the intuitive contours of our minds. Steve Jobs has transformed the inhuman integers of 0s and 1s into a humane language that all of us can understand. This has practical implications in our world. If we stopped thinking about “just the numbers” and more about what they meant–the values– then we would see the human faces behind our 9% unemployment rate: brothers and sisters who have are looking for work so that they can feed their families, keep a roof over their heads, and maintain their dignity. Steve Jobs wanted us to think about our world and the ways that we can make it a better through our individual experience. Thank you, Steve Jobs. You have expanded the possibilities of my life and the lives of my children. The day-to-day operation of TranslatingCuba.com and HemosOido.com is accomplished on an iMac and a Macbook. There are very few people outside of my family that I can say have had a positive effect on me. One man and his singular vision revolutionized not one but several industries. His technological vision was such that from kernels of ideas he created the first personal computer, created a computer with a graphical user interface, practically invented the digital publishing industry along with Adobe and Aldus, changed the way we listen to music, buy it, interact with it. And, he gave us the best damn smartphone ever developed. I am sitting here, writing this on one iteration of that computer, my iMac, and next to it are my iPhone, my Apple router, my iPad, and my iPod. They just work. Thanks to Steve. Jobs was a genius, no doubt, but his kind of genius is not the E=MC2 kind; his is the evolutionary kind whose life's work, when taken in toto, amounts to a greatness few ever achieve, a greatness that touches so many lives with positive energy and delight. My generation has just lost its luminary. You changed the way we worked, played games, listened to music and spoke on the phone. You changed our world in so many ways it is impossible to describe. You believed in your dreams and made us dream with you. In one phrase, you made us think different. You have left an indelible mark on this world and made it better for millions of us. This blog, since inception has always been written on an Apple computer, starting with a Powerbook and then moving to a succession on MacBook Pro's. Every computer I have ever owned has been a Mac, somehow, I've never been a PC type of girl. Whether you liked him or not, used his products etc, we have lost a visionary make no mistake. Since the second coming of Jobs at Apple the company has consistently pushed the envelope to create products that capture the imagination and by so doing, changed the face of world. Apple has inspired many to continue to reach, to up their game, Tim Cook has large shoes to fill. And in truth, Apple may continue on brilliantly, but it will never be the same. Steve Jobs officially became my boss in May 2005 and in the last six years, from part-time on the sales floor to full time tech support, I’ve participated in the launch of four iPhones, two iPads, three operating systems, the transition from PowerPC to Intel. I’ve introduced people to devices that have changed their lives, I’ve helped them get back on track when their favorite device doesn’t quite do what they expected it to and showed them how make the computer they’ve had last just a little bit longer. Thank you Steve Jobs, for giving me and tens of thousands of retail employees the power to help people in whatever way we could. You didn’t hire each of us individually but your vision created the space for us to exist and I’m honored to have had you as my fearless leader. The thumbnail image used in this post, “Steve Jobs tribute”, is by David J Lowe, used under an Attribution-NonCommercial-ShareAlike 2.0 Generic (CC BY-NC-SA 2.0) Creative Commons License. Visit David J Lowe's flickr photostream. Dancehall star Vybz Cartel now faces murder charges in Jamaica; The Caribbean Camera has the details. All links lead to Portuguese language pages. 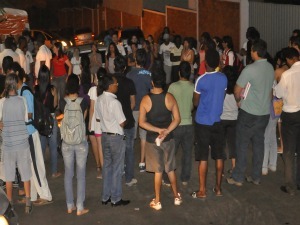 Around 100 people gathered in Cuiabá, the capital of the Brazilian state of Mato Grosso, on September 23, 2011, to protest against violence and call for justice in the wake of the murder of Toni Bernardo da Silva, a 27 year old Economic Science student from Guinea-Bissau on Thursday, September 22. The protest, which took place in front of the pizzeria where Toni was beaten to death, was organised by a group of African students who are part of an exchange program between the Brazilian government and lusophone countries in Africa. Toni was a a student at the Federal University of Mato Grosso (UFMT). Toni Bernando. Photo from personnal archive. According to the civil police, the former student arrived at the restaurant around 11pm and started asking clients for money. While passing one of the tables, Toni bumped into a woman. The woman's boyfriend, a 27 year old business man, and two military policeman who were in plainclothes at the site, forcibly removed the university student from the establishment and began to attack him with punches and kicks. The medical report indicates that death was caused by disruption of the trachea, caused by a sharp blow by a person who practices martial arts. The suspects were charged in the act and will respond in court for the crime of murder. In a statement, they said that they had only immobilised the youngster. The crime has caused outrage among the academic community, which is demanding justice and greater security for the students. 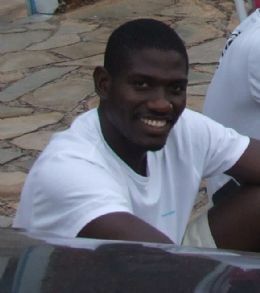 In 2010, Global Voices reported [en] on another case of aggression against a student from Guinea Bissau. Photo of protest, by Deivison Almeida (used with permission). UFMT released a message regretting the incident and contacted the Ministries of Education and Foreign Affairs, who coordinate the exchange program, as well as the Federal Police. Em 2010, a Pró-Reitoria de Ensino de Graduação apoiou o então aluno e tentou auxiliá-lo para resolução de seus problemas acadêmicos e pessoais, que geraram o abandono dos estudos e a reprovação. Foi prestada assistência e oferecido acompanhamento psicológico ao estudante, por meio da Coordenação de Assistência e Benefícios (Cabes), sem a sua adesão satisfatória. Consequentemente, o desligamento ocorreu em fevereiro de 2011, conforme as exigências estabelecidas pelo Convênio PEC-G/MEC/MRE, entre as quais o abandono dos estudos e a reprovação. In 2010, the Dean of Undergraduate Studies supported the student and then tried to help him to solve his personal and academic problems that had led to the abandonment of his studies and eventual dropout from the course. Assistance and counselling was offered to the student, through the Coordination of Assistance and Benefits without satisfactory accession. Consequently, the “shutdown” occurred in February 2011, according to the requirements established by PEC-G/MEC/MRE Agreement, which include the course drop-out. According to student Catende Malan Domingos, 23, who is also part of the international exchange program, Toni had abandoned his studies due to discouragement or to some diesase. On the other hand the police state that he was a drug addict and had a record of theft. Since February 2011 his family had been sending him money to survive on while he was looking for a job. He has left a Brazilian girlfriend who is pregnant. 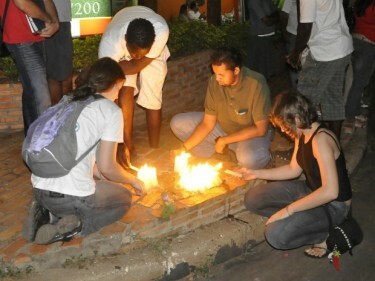 Students light candles in mourning for Toni. Photo by Deivison Almeida (used with permission). (…) alguns veículos publicaram e ainda publicam o fato de uma forma estranha, parecem até que estão procurando justificativa para o fato, desvirtuando o foco da morte de um ser humano que poderia ser brasileiro, africano ou iraquiano. some [media] vehicles have published and are still publishing the fact in a weird way, it looks as if they are trying to find a way to justify the fact, distorting the focus of the death of a human being who could be Brazilian, African or Iraqi. que a Universidade (UFMT) [tome] alguma atitude no sentido de os representar, bem como ao jovem assassinado, pressionando a justiça brasileira a não permitir que o caso [seja] (mais uma vez) abafado e que os culpados recebesse a punição merecida. Fizeram uma passeata a pedir Paz. A polícia não deve estar confortável com esta atitude. Há indícios de que a polícia esteja a tentar silenciar as testemunhas e a fazer contra-informação. A polícia ronda o bairro escuro e pobre onde a maioria destes estudantes moram. Por alguma razão estes jovens não se estão a sentir mais seguros com isso. the University (UFMT) [needs to take] some attitude towards the representing them as well as the murdered boy, pressing the Brazilian justice system not to allow the case [to be] (once again) muffled and the guilty to receive the deserved punishment. They marched to ask for peace. The police should not be comfortable with this attitude. There is evidence that the police are trying to silence the witnesses and make counter-intelligence. Police round the black and poor neighbourhoods where most of these students live. For some reason these young people don't feel safer with it. Friends and university colleagues of Toni have put candles in front of the crime site. Photo by Lucas Ninno (used with permission). Se ninguém mais no mundo souber do que se está a passar ali o que será que lhes pode acontecer mais? O medo instalou-se. A História conta-nos que o medo é inimigo da razão, da sensatez. Quantos não são os casos de escaladas de violência nas ruas que começaram exactamente assim? If no one else in the world knows what is happening there, what more can happen to them? Fear has settled. History tells us that fear is the enemy of reason, of prudence. How many cases of street violence have begun exactly like this? The Brazilian Minister of Foreign Affairs Antonio de Aguiar Patriota personally presented his apologies to Ambassador Queta, Chancellor and future Minister of Justice of Guinea-Bissau, on behalf of the Brazilian government for the violence committed against the youngster. The heads of state are in New York because of the 66th annual meeting of the United Nations. A former political prisoner blogs about his experience with the Cuban jail system, here. The American economy is at a standstill and seems stuck on that plateau. The unmovable unemployment rate has been added to the poverty rate that affects more than 46 million people, the 15.1 percent of the population, according to the latest Census figures. Experts confirm that this is the highest rate since 1993. The numbers reveal a panorama that isn't very encouraging. The average domestic increase suffered a drop of 2.3 percent since 2009. The number of people without medical insurance coverage is about 50 million people, and the number of people older than 16 who haven't worked at least one week, increased to 83.3 million in 2009 to 86.7 million last year. Unfortunately, the minorities, Hispanics in particular, aren't excluded from the spectre of poverty. The average suffered a sharp decrease of 2.3 percent, from US $39,667 to US$37 37,759 in 2009, which indicates that this group still hasn't recuperated from the effects of 1999 that caused the drop in 2001. To put the severity of this issue in perspective, poverty in the United States also exceeds that of other countries in Latin America like Argentina (8.1 percent), Chile (9.8 percent), Uruguay (6.3 percent), and is getting closer to that of Brazil (19.3 percent), according to a report from the Economic Commission for Latin America and the Caribbean (ECLAC). Mientras que la renta per cápita se redujo en 1.2 por ciento para el conjunto de la población, en el caso de los hispanos descendió un 3.5 por ciento entre 2008 y 2009. También empeoró el nivel de ingresos de las familias, que se redujo casi un 8 por ciento, sólo por detrás de las afroamericanas (con un 11.8 por ciento) y en comparación con niveles del año 2000. While the per capita income decreased by 1.2 percent for the entire population, in the case of Hispanics the reduction was actually of 3.5 percent between 2008 and 2009. Family incomes were heavily affected, from a reduction of almost 8 percent, closely following African American women (with 11.8 percent) as compared to the data from the year 2000. El 15,2% de los estadounidenses vive en la pobreza, lo que se traduce en más de 46 millones de habitantes. Su nivel más alto desde 1993, informó la oficina de censos de ese país. 15,2% of Americans live in poverty, which translates to about 46 million inhabitants. This is the highest level since 1993, according to the national census data. Esta es otra situación muy negativa, sobre todo cuando el presidente acaba de presentar un plan de empleo con el cual se espera darle un estímulo a la economía. It's not a very favourable situation, especially after the president just presented an employment plan in which he promises to boost the economy. Hispanos=37 por ciento de los niños en pobreza según un nuevo reporte del censo…espeluznante! Hispanos=37 percent of poor children according to a new report on the census… hair-raising! Uncommon Sense continues to keep a close eye on three members of the Damas de Blanco who were arrested recently, as well as political prisoner Sara Martha Fonseca, whose son was allegedly attacked after trying to obtain information about his jailed parents. Pedazos de La Isla uploads a video showing “what happened on Saturday, September 24th, to Sara Marta Fonseca Quevedo and other dissidents who were peacefully protesting”, while Uncommon Sense notes that Fonseca has since begun a hunger strike.